Berea College (Berea, KY): Maximum number of transferable semester hours is 43. Eastern Kentucky University (Richmond, KY): Approved statewide "transfer frameworks" with some Kentucky community colleges. All courses apply to general education. Kentucky Christian University (Grayson, KY): Three letters of recommendation required. 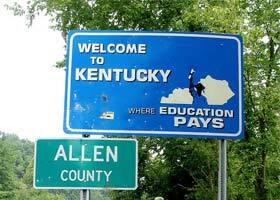 Kentucky State University (Frankfort, KY): Pre-college curriculum required of all transfer students; students who have yet to take or complete classes must fulfill them during the first 30 semester hours at the school. Kentucky Wesleyan College (Owensboro, KY): Grade of "D" accepted for students holding A.A., A.S., or A.A.S. degrees. Transylvania University (Lexington, KY): Credits evaluated on an individual basis. Correspondence courses are not normally transferable. Western Kentucky University (Bowling Green, KY): Some programs may not transfer credit for any course which carries a grade less than C.